"Loved me black and blue, No more sorry"
Average rating: 77/100 (from 482 votes). About album of the day: The BestEverAlbums.com album of the day is the album appearing most prominently in member charts in the previous 24 hours. If an album, or artist, has previously been selected within a x day period, the next highest album is picked instead (and so on) to ensure a bit of variety. A full history of album of the day can be viewed here. I used to have Streetlight Manifesto and Manic Street Preachers confused, so I avoided listening to this album for a long time. I gave it a listen several months ago, and I was pleasantly surprised. Great songwriting and some thought provoking themes. One of the few albums I used to listen to everyday as a teenager but still really love. As I've growing older, I have moved away from this album, but its still an essential listen. For me, the whole thing is a concept album that should be called the natural history of human evil. Every song seems to capture a portion of human malignancy, modern capitalism, serial killers, the holocaust, down to the internalization of personal self destruction in the likes of anorexia, its not a fun listen. It reminds me of the downward spiral, but this one has greater weight because it has the words to back it up. The horrifying thing is that in retrospect this album feels like a suicide note for Edwards. Definitely top 5 depressing albums of all time. Check out my yearly charts as they are constantly updated! Currently listening to: 1970 and 1992! I grew up on the Manics but I don't quite share everyone else's enthusiasm for this album these days. I do think its one of their better ones but listening again I'm a little disappointed. I basically feel that the Manics were a very competent classic rock band that added extra spice with some the edgy lyrics-which are interesting but don't always totally work for me. Even on this supposedly uncompromising album they still sound fairly tame musically compared to some other things at the time. Though yeah they had some very good riffs and neat choruses-I still think they basically got blown out of the water in the mid 90s by the likes of Radiohead and Smashing Pumpkins. 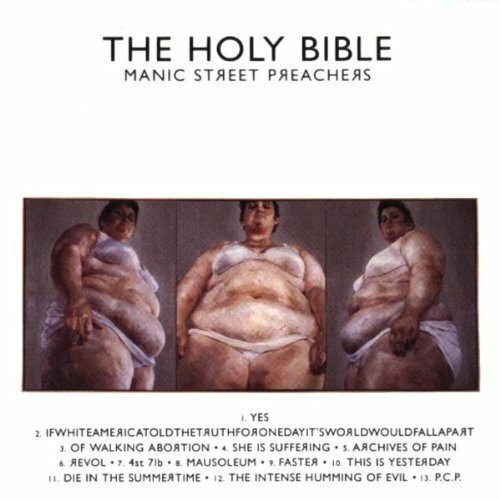 For me the Holy Bible has held its own much more so than the Bends or Mellon Collie, although I'd agree the Manics were effectively eclipsed by Radiohead at the time (if not the Pumpkins, who had pretty much ceased to put out anything decent apart from the underrated Adore).